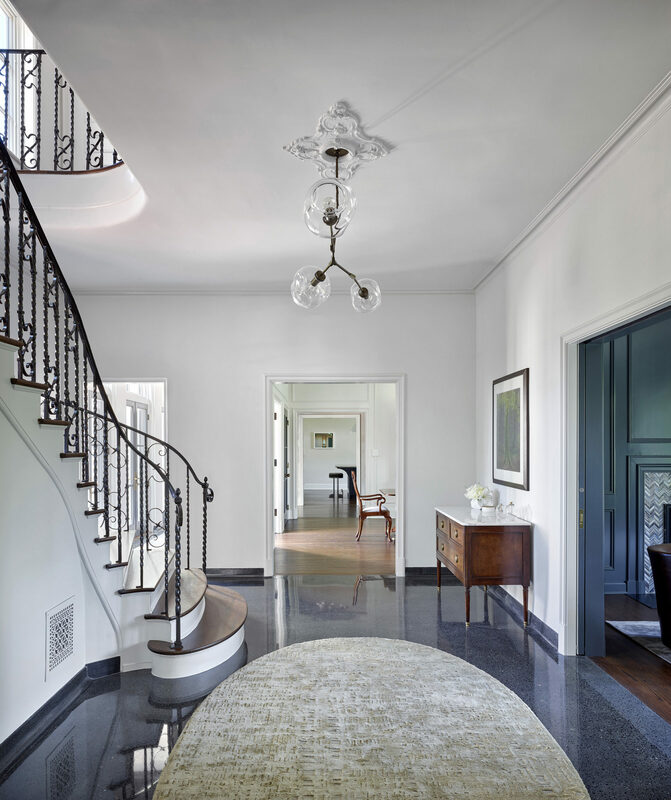 A welcoming foyer with organic branching light fixture by Lindsey Adelman softens the formal entry and an oval rug by Oscar Isberian is a nice contrast to its rich terrazzo floors which lead the way to the library that was designed with millwork details that are accentuated by a rich blue Benjamin Moore paint color. 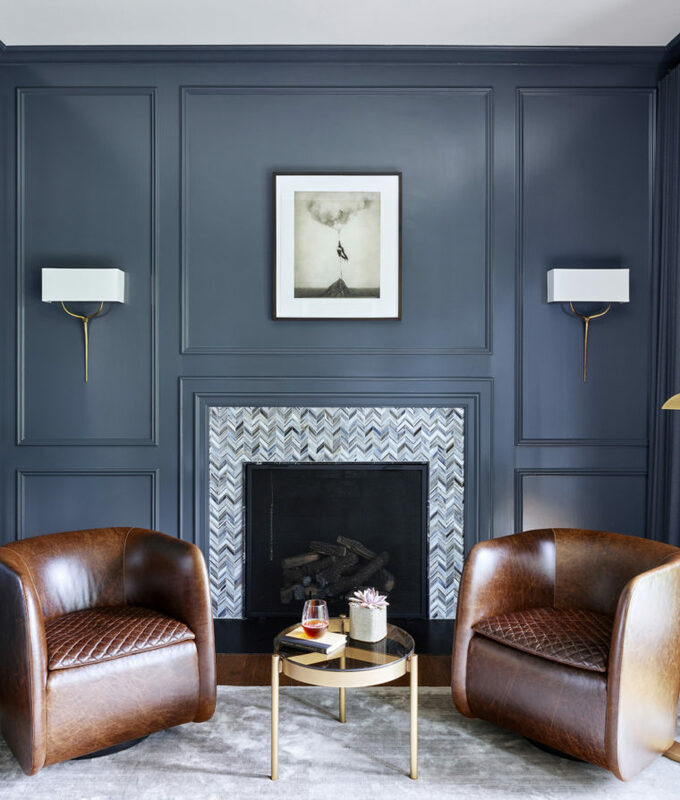 Bright swivel chairs flank the handsome fireplace and sconces by Christopher Guy offer gentle light, a well-appointed vellum & antique brass desk from Julian Chichester and stunning Visual Comfort lamp complete the room. 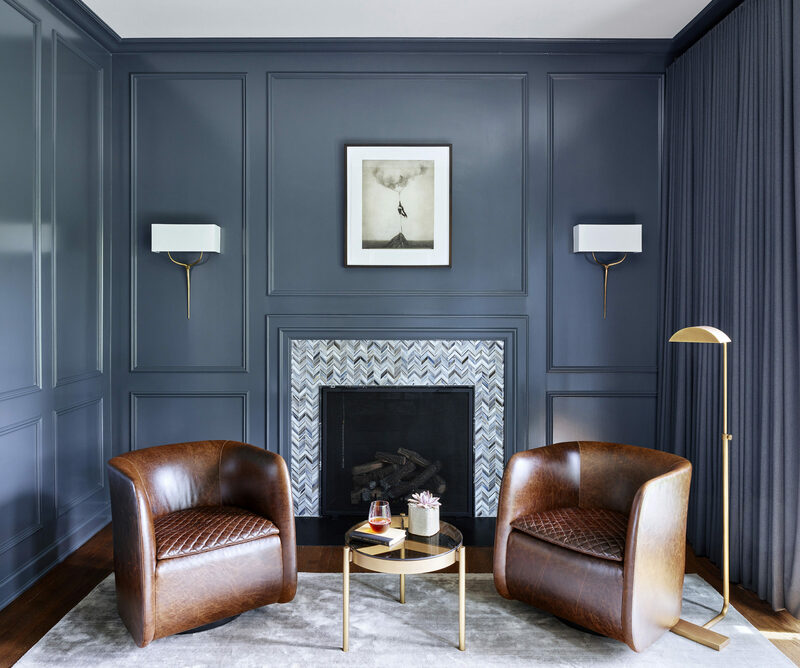 Enhancing the subtle elegance and detail of the space was paramount in this Morgante Wilson design. A rich grey & ruby Organic Looms rug anchors the leather Ochre chair and George Smith sofa in Kravet fabrics. The furthest sofa was reupholstered in a mink Rodolph velvet. , and the room is finished with Borvier & Toso sculptural glass fixtures that warm the space with soft light. 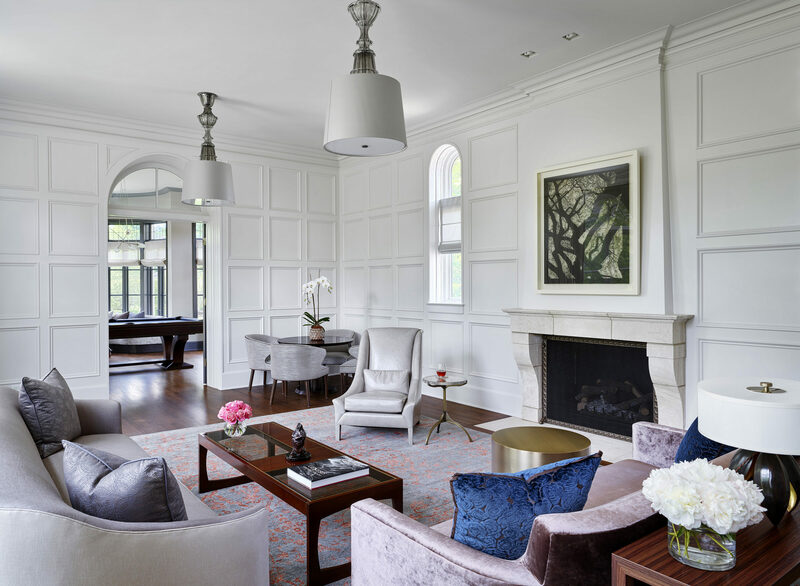 A custom walnut game table by Vas Designs is complemented by Bright tub chairs draws your eye to the adjoining Billiards Room that focuses on viewing the outdoors. Windows and french doors are treatment with elegantly simple roman shades by Glover Shade & fabric by Holly Hunt. A custom banquette by Park West Furniture is covered in Romo fabric. with a custom metal table by Rustic Elements providing the perfect complement for this inviting space. The dining room as a conversation between the old with the new. 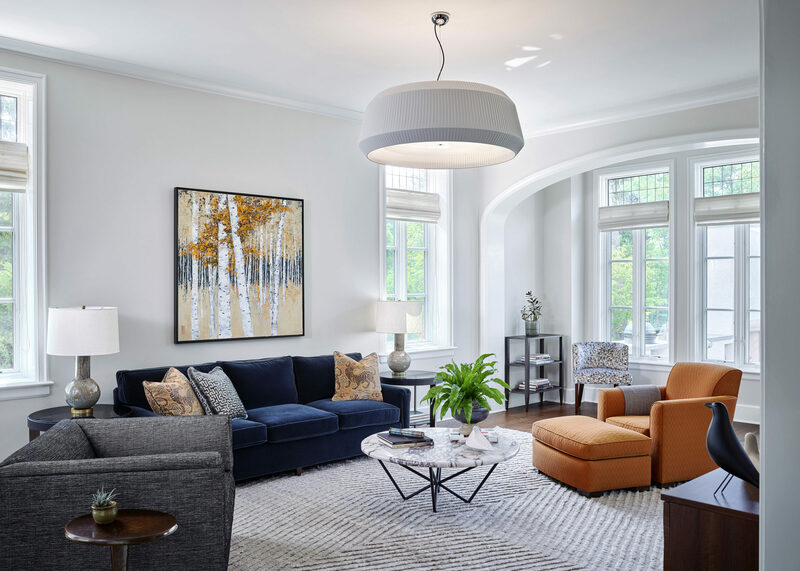 A vintage Baker dining table & head chairs were paired with fully reupholstered side chairs by Eurocraft Furniture in Holly Hunt fabric to give an exciting modern edge, pairing nicely with the airy Zaneen linear sphere pendant. 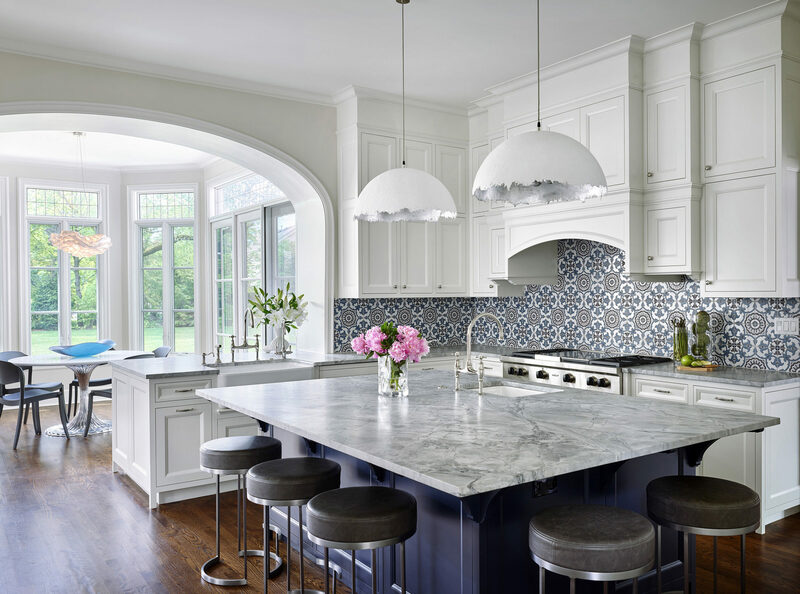 Morgante Wilson Architects designed this beautiful kitchen space featuring Catellani & Smith dome pendants via Lightology provide light over the island. While the elegant Breakfast Room features a graceful dining table by Oly which pairs nicely with grey Janus et Cie outdoor chairs. The chairs can be taken outside for an impromptu summer meal as well. 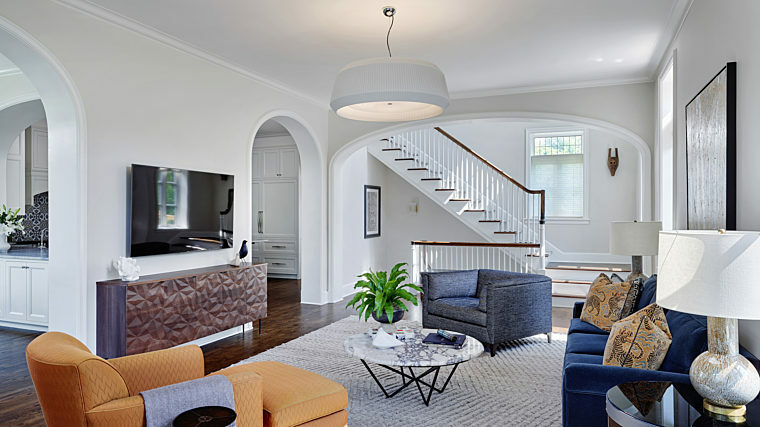 An Arturo Alvarez pendant offers a sculptural light source that showcases a Martha Sturdy fruit bowl. 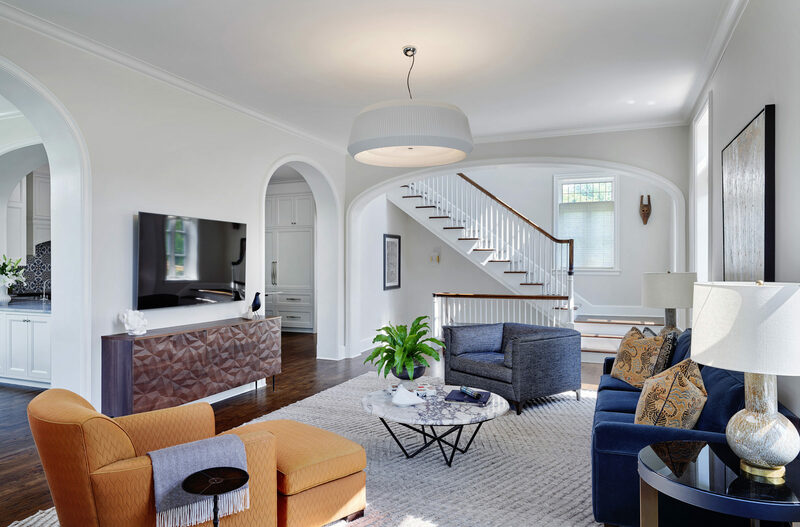 Morgante Wilson Architects designed this Family Room with openness in mind. The seating group allows for good conversation as well as quality TV time. Park West Furniture recovered the sofa chair. And the Kara Mann coffee table and box lounge chair bring a modern air to the room. The media console is a custom piece by Hammer Design and utilize panels from Intersource and legs from Ferrous Hardware. The bedroom is designed with an arched ceiling to add subtle drama. The Berhardt bed is the anchor in the light room, with custom burl nightstands by I2I Design. 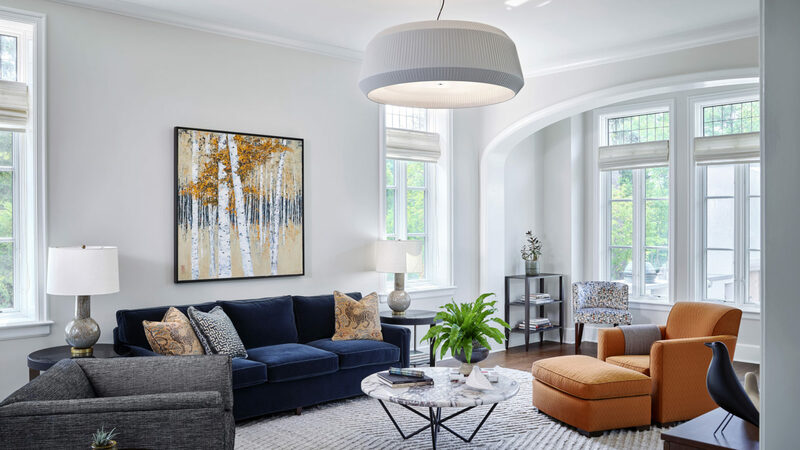 Visual Comfort Alabaster table lamps emit a warm glow for reading before bed, and the suite is completed with a stunning master bath that features lighting by Helenbilt. Custom drapery by Glover Shade. The nearby home office that overlooks lush grounds. The Kravet desk chair offers a spectacular view of the natural world outside. The finely detailed desk by Century Furniture provides a workspace without obstructing the view.